Check the interlock system for proper operation. 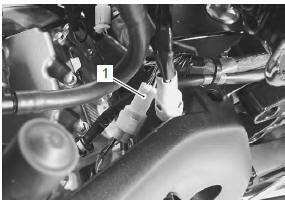 If the interlock system does not operate properly, check each component for damage or abnormalities. If any abnormality is found, replace the component with a new one. Disconnect the side-stand switch coupler (1). Measure the voltage between g and b/w lead wires. if the tester reads 1.4 V and below when the tester probes are not connected, replace its battery. Connect the side-stand switch coupler. 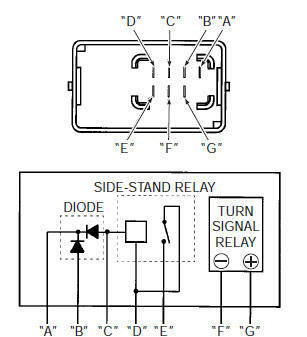 The turn signal/side-stand relay is composed of the turn signal relay, side-stand relay and diode. Remove the turn signal/side-stand relay. 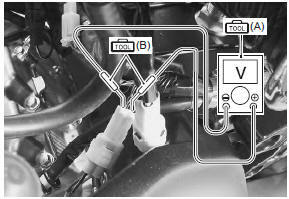 Refer to “turn signal / side-stand relay removal and installation” . Check the insulation between “d” and “e” terminals using the multi-circuit tester. 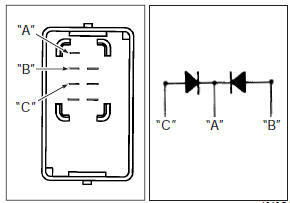 Apply 12 v to terminals “d” and “c” ((+) to “d” and (– ) to “c”) and check the continuity between “d” and “e”. If there is no continuity, replace the turn signal/ side-stand relay with a new one. Install the turn signal/side-stand relay. Refer to “turn signal / side-stand relay removal and installation” . Measure the voltage between the “a”, “b” and “c” terminals using the multi-circuit tester. if the multi circuit tester reads 1.4 V and below when the tester probes are not connected, replace its battery. Disconnect the gear position switch coupler (1). when disconnecting and connecting the gear position switch coupler, make sure to turn off the ignition switch, or electronic parts may get damaged. Check the continuity between bl and b lead wires with the transmission in “neutral”. Connect the gear position switch coupler to the wiring harness. Turn the ignition switch on and side-stand to upright position. Measure the voltage between p and b/w lead wires using the multi-circuit tester when shifting the gearshift lever from low to top.